Video Conference allows live visual communications between two or more locations. These locations are normally geographically separated by large distances. Video Conferencing allows for communication of Video, Audio and PC Content. Video communication is available via camera capture or content connected to the video conference codec IE: PowerPoint, DVD Video etc. Audio communication is available via microphones and other connected audio devices. Video Conference is available on dedicated hardware, computer, smart devices and even certain hardwired telephones. 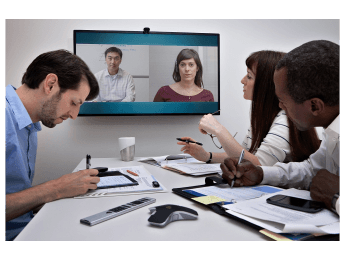 With the wide range of video collaboration hardware devices, almost anyone can participate in a meeting. Video communication network infrastructure can be provided as appliance or cloud based video bridges. These video bridges allow for multiple concurrent meetings across a network infrastructure. Meetings can be setup with multiple participants, even in the thousands. The video bridge also allows different communication devices to connect and communicate over different video protocols. A meeting could consist of Skype, mobile phones, PC’s, video codecs and even PSTN phones. Video Conferencing has become a valuable communication tool in the business world. Reduced Travel Expenses – Video Conference meetings can be held on a global basis between multiple sites, saving time and money. Reduced Project Time-lines – Video conferencing can assist in meeting project deadlines with regular meetings and no time delays due to participants locations. Remote Training – Training can be done to all remote divisions of an organisation via Video Conference allowing for an increase in frequency and reducing travel expenses. AVC supplies, installs and maintains professional video communication brands like Polycom, Cisco, LifeSize, Yealink and more.